The potential health benefits of coloured rice are the subject of new research at the Functional Grains Centre at Charles Sturt University (CSU) in Wagga Wagga. 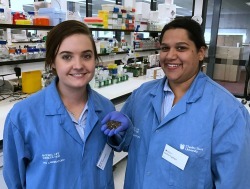 Participants in the study are being sought by CSU PhD students Ms Kiara Thompson and Ms Esther Callcott as they investigate if the bioactive compounds in whole grain coloured rice varieties have therapeutic effects for obesity and related diseases such as cardiovascular disease. "The seed coats of coloured rice are rich in antioxidants and our aim is to test the role of these chemical compounds in reducing blood clotting, inflammation and chemical damage to cells in overweight or obese people and in those who have type 2 diabetes," Ms Callcott said. The researchers are seeking people who are overweight or have type 2 diabetes to take part in the study. They will be asked to complete a health and food questionnaire, body measurement and give a small sample of blood. "We'd like to hear from people who are overweight or obese, that is those with a Body Mass Index of greater than 24.9, and or, those who have type 2 diabetes," Ms Thompson said. "To take part in the study people need to be non-smokers, aged between 18 and 65, who are not pregnant and who don't suffer any chronic diseases. "We also need to ensure they're not taking anti-inflammatory or anti-clotting medication." The research is supervised by Dr Abishek Santhakumar and Professor Chris Blanchard from CSU's School of Biomedical Sciences. The Functional Grains Centre is an Australian Research Council (ARC) Industrial Transformation Training Centre and is an initiative of the Graham Centre for Agricultural Innovation. For further information email Ms Kiara Thompson or Ms Esther Callcott. Media Note: The research has been approved by CSU's Human Research Ethics Committee.